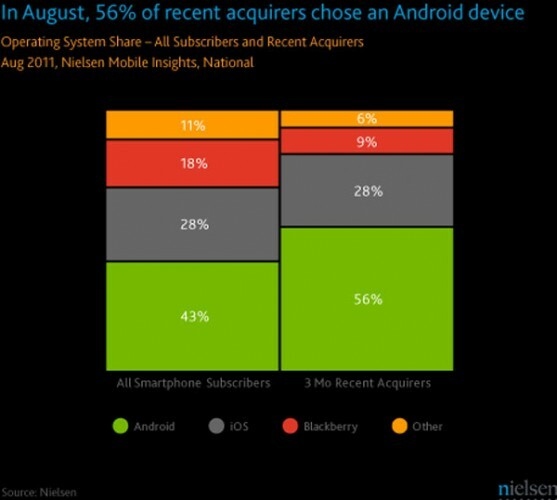 According to statistics from a survey done in August by Nielsen, Android sales are picking up. As of August Android smartphones had 43 percent of the market. Currently the market is favoring Android. During the last three months 56 percent of smartphone purchases were Android devices. According to Nielsen this is a good indicator of where the market is going. iOS is in second place with 28 percent of the market. It is possible that numbers for iOS are down due to the fact that people are waiting for the new iPhone 5. The next iPhone is believed to arrive in October. Overall according to Nielsen’s figures the smartphone market is growing with 43% of all subscribers in the US using a smartphone. Additionally out of the devices purchased during the last three months 56 percent were smartphones.